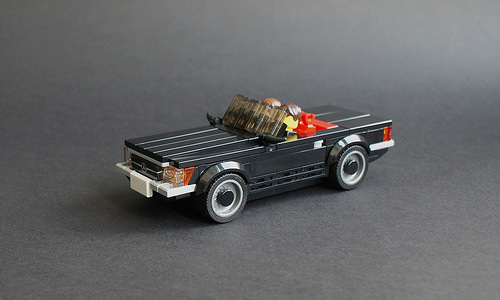 When it comes to minifigure-scale cars, Jonathan Elliott has proven to be the master of his craft. Jonathan is back on the road with three great cars, two of which might look a little bit familiar if you happened to be following us back in November 2017. He is back with two sweet mods, as well as something completely different! Get ready to start your engines for the Porsche 911 Turbo, which first hit the scene back in 1975. Jonathan’s modifications bring the 260 hp turbocharged legend to life, complete with the famed “whale tail” spoiler. The iconic Porsche curves are also here, right down to the subtle slant of the rear windshield and feels proportioned just right. (If you will recall our review of Speed Champions set 75888, one of our laments was that the 911 was just a stud too long.) 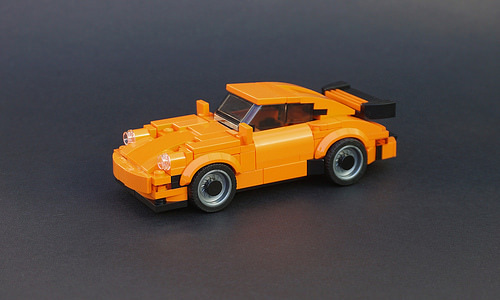 An added bonus is the car’s vibrant orange exterior color, which is reminiscent of the Porsche 911 set available through LEGO Shop at Home. 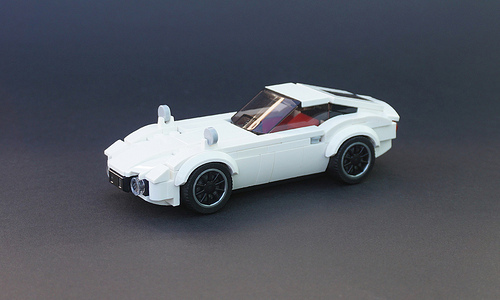 A personal favorite of mine is Jonathan’s Toyota 2000GT, a Japanese sports car which was short-lived (1967-1970). Production was limited to 350 cars, making it a very rare breed indeed! Around 60 of these vehicles made their way to American shores, and they would have stood unique in a country that was captivated by American muscle cars. Jonathan’s version is a faithful-looking replica, right down to the wing mirrors way ahead of the front windshield. This was typical of Japanese cars from the period because Japanese law required mirrors to be visible to the driver through the windshield. A few months ago, one of these rare cars sold at auction for a whopping $665,000. Fortunately, Jonathan’s little 2000GT won’t break the bank or require additional garage space. Last but not least is this slick black 1972 Mercedes-Benz R107; series production spanned two decades (1971-1989). For 1972, Americans received a larger engine than Europeans in order to compensate for loss of power under U.S. emissions rules. Jonathan originally built this car in white back in November, but he received a commission to render it in black for a wedding. While it might have been a nice day for a white wedding, Jonathan’s client must have felt the car looked even more stunning in darker colors. Looking at them side-by-side, I think I’ll have to agree!